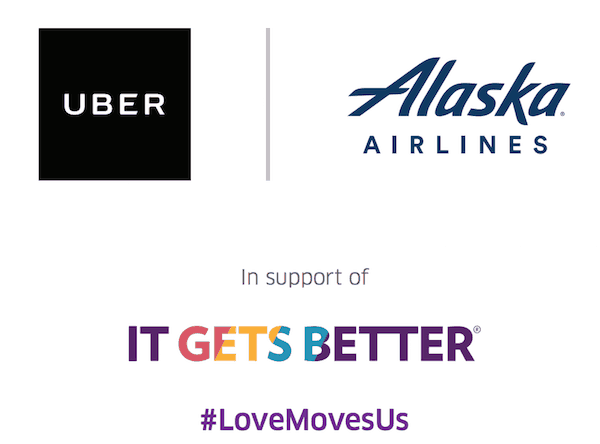 This year Alaska Airlines and Uber are teaming up for LGBTQ Pride events across the West Coast. There are three aspects of this partnership which I go in to below. But perhaps most interesting is the Alaska Airlines Uber Pride Contest for for reasons I’ll go in to. 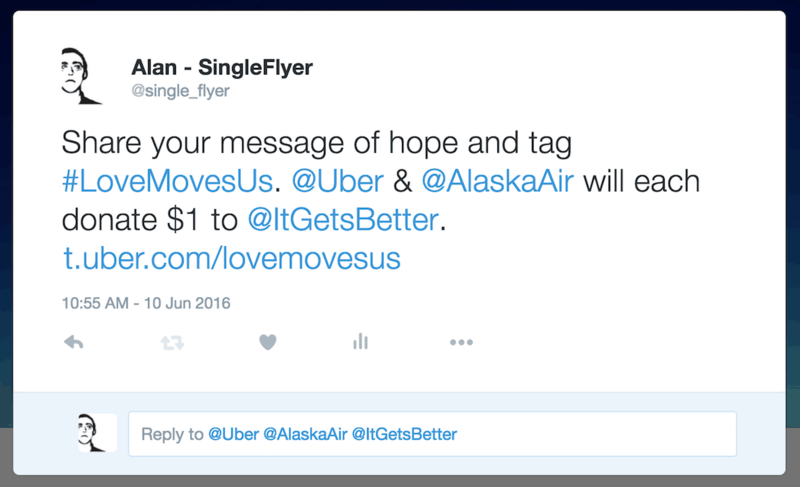 The first aspect of the partnership is a hashtag that, when you tweet it, Uber and Alaska will each donate $1 to the It Gets Better Project, a “non-profit spreading messages of hope and support to LGTBQ youth”. Each company will donate up to $14,000 during the month of June. However, the promotion page also lists some additional cities, so I think the terms and conditions are a bit outdated. I was able to get the discount to work on the additional cities. 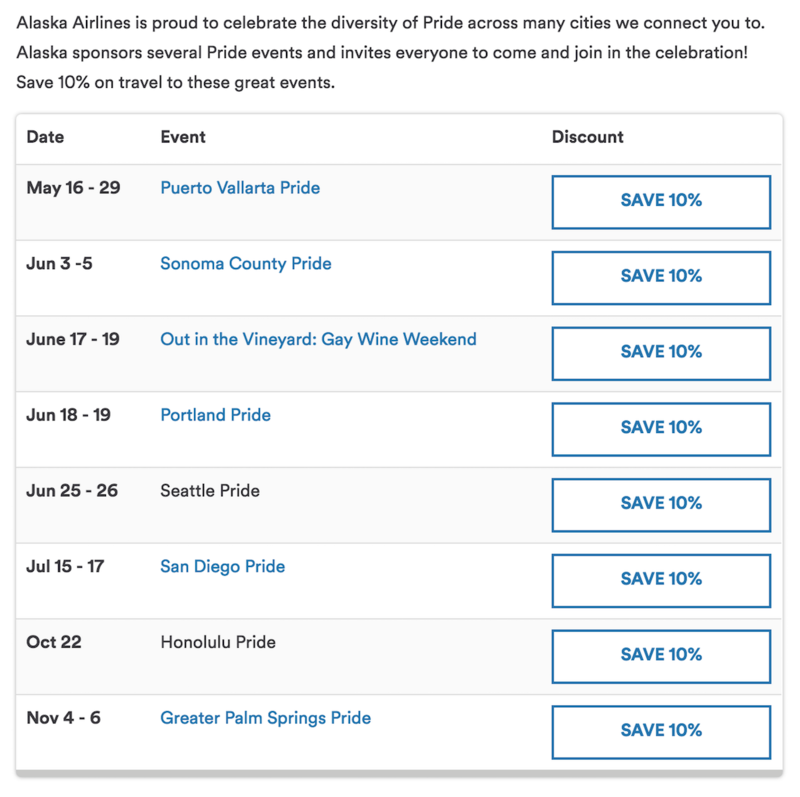 The third, and perhaps most interesting, piece of this promotion is the “Ride With Pride” Alaska Airlines Uber Pride contest. When you take an UberPool (or UberX if the city doesn’t have UberPool) during the week of Pride in the listed host city AND enter the promotion code in your Uber app, you will be entered in a contest to win two round trip tickets to anywhere that Alaska flies. 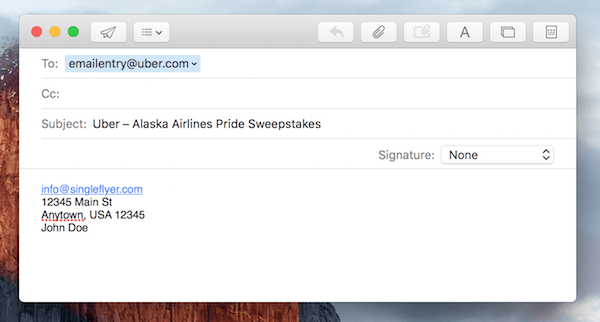 Or enter by Electronic Mail: send an email to emailentry@uber.com specifying the name of the sweepstakes (“Uber – Alaska Airlines Pride Sweepstakes”) in the subject line of the email. Entrants must also include ONLY the following details in the body of the email: Entrant’s email address, mailing address, and name. All email entries must be received by no later than the end of the specified Sweepstakes Period. There is a limit of 22 entries per Entrant. You can enter up to 22 times. It isn’t clear, but my reading would be that is per contest city, so you could enter 22 times during the week of June 6-12 for Los Angeles, then enter another 22 times during the week of June 13-19 for Portland. However, the rules could be read as only 22 total entries across the span of the contest. It is a pretty easy way to enter a contest — no cost and copy and pasting should only take you a couple of minutes to send the 22 emails each week. It’s great to see Alaska and Uber supporting Pride. Are you planning on taking advantage of the 10% off flights or entering the Alaska Airlines Uber Pride contest?